Best Online video maker for your marketing video production! →Best Online video maker for your marketing video production! An online video maker is a complex, yet simple-to-use web application that helps in producing marketing videos. There is no doubt that videos are crucial in today’s business expansion. That can simply be explained by the rapid growth of video sites like Youtube. Producing marketing videos used to require huge monetary investment. Given the important demand in the this industry, there really is need for developers to sit up. I recently came across MakeWebVideo.com, an excellent online video maker. I was seduced by its ease to use, the number of professional templates available and the top quality of the final product. So I thought sharing about it will help my readers gain an edge over their competitors in video marketing. As a matter of fact, I have come across a couple of such video producing applications. For the most part, the quality of the final product is often not worth the investment. That’s always the trouble. As long as visual and sound qualities are not maintained, the very purpose of the sales video is being compromised. Here is what the video editing wizard looks like. 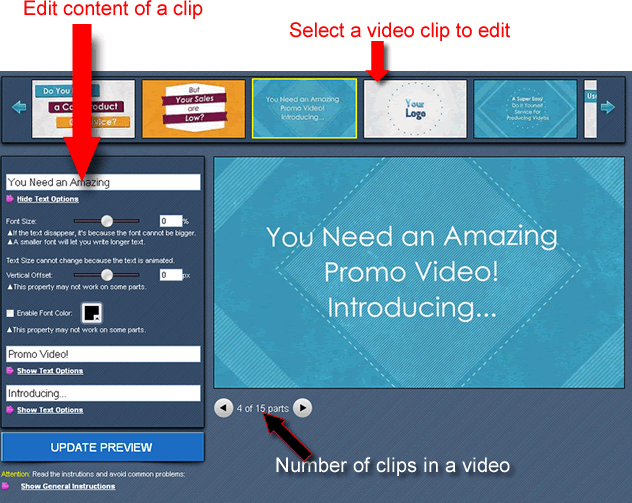 Just select a clip and you are presented with a user-friendly clip editor! Choose a template – Excellent templates produced using Adobe After Effects. Insert your own text, images and music. Create your final video – You either download your videos or let them hosted by the service. It’s super easy to share and embed the hosted video on your website to play on all pc’s and iOs devices. One of the first things I loved with this app is how much I was able to customize my videos. What I needed to do was just pick a template and then start changing text, graphics and sound. Each video is broken into parts or video clips. You can easily select any clip and edit its content – text, text colors, images, etc. Once you are done with editing and doing the necessary modifications, with a simple click of a button, your video is ready. Professional Adobe After Effects Templates! I went through the platform and found a huge collection of quality stock music in different categories. Though each video template has a default music built in, you can select a sound track from the stock and replace the default sound. You also have a possibility to upload your own mp3 file to your video. Here is a demo video that took me less than 30 minutes to complete. Isn’t this really cool? That’s one quick video I did so you can have a feel of how this tool looks like and how it’s a perfect online video maker for your web video production. Now you are able to appreciate both the visual and sound qualities of these videos. Do I intend to switch to another online video maker? Right now, this tool perfectly fits into what I want in a web video maker. The quality is top. I can fully customize by adding more photos, sound, importing more videos to clips, etc. Once a video is complete, there is always the flexibility to apply more changes. The fact that they host my videos too is another plus. I won’t have to download and reload on Youtube or on any other video platform. Is this online video maker affordable? You can have a professional web or HD video from $39 upward. This is unlike elsewhere where you pay hundreds of dollars for such videos. However, the longer your video, the more you pay. Go to http://makewebvideo.com. Sign up and create free videos. All the tools are available for free trial. You only make payments if you are satisfied with the results. I’ve just came across a site called goanimate.com which also does the job of creating explainer videos. One of the major differences I’ve seen here is that, it costs a bit more. Go Animate costs about $39/month. I don’t know of goanimate but the difference always lies with what you get with $39/month. Often, the number of templates and stock music get limited, the length too gets limited, etc. A closer look at the options, you may want to pay $99 for 1 video that offers the best options. Enstine Muki recently posted…How To Be A Better Blogger With Kevin Duncan! Very nice site.Great video making tool,really.loved it.Thanks Enstine for this. I have been looking for a SIMPLE but professional video editor for awhile now. You’re right, videos and video marketing is absolutely crucial in today’s marketing world. I have had the issue of dealing with people who want to charge an arm and a leg to make a professional video (I am guessing because they know it is hot and in demand right now) so starting at $39 for a video that could end up making you thousands is a pretty good trade off, I think! Thank you for bringing this site to my attention, and the attention of others! Finally I can stop trying to create and edit my own videos, or pay too much for something that isn’t worth it! I loved the simplicity and quality of this tool so that’s why I brought it to my readers. Besides, you can give it a try even without paying anything. You only get to pay after previewing your creation with satisfaction. Video marketing is really important aspect of digital marketing, and having creative and interesting is key to create viral video. That’s where such online video maker tools play crucial role. I’m also looking to create few videos and would love to try free trial. It’s great MakeWebVideo I like the video that you have created Enstine, though I’m not now use this but its good to know it from your blog. I’ll recommend it to my friends so I’m sharing it, Thanks! Very nice video you made for EnstineMuki.com! Approximately how long did it take you to create it? I’ve yet to dip my toes into the video marketing waters, but it’s something I may do in the future. I’ll be sure to remember this post of yours and come back to it! Hope you’re having a great day, Enstine. It took me about 30 mins to get that video done. Just feeling the forms on every clip in the video wizard. It’s quite simple. As you probably saw a few months back that I had done a free one using PowToons. I thought that it was pretty cool but I have to admit I like some of the other videos I’ve seen online a lot better. Actually, the last one you showed is more along the lines of what I was looking for but the prices that these companies were charging was high. Heck, I knew they had the software to do it so I was paying for their time and the product so I can’t blame them for wanting to make a living. For about $40 to start that’s not bad but I’ll just have to look into that more. Do they give prices for the length of the videos? You did a great job with your video but the music was a little much for me. All in all though I agree with you, great program so thanks for the introduction. I have not done anything with PowToons before but I must admit this one has very professional templates and the prices are quite friendly. Yes, the longer the video, the more the price but non is over $99. Thanks for pointing these out. I would have never thought to look otherwise! I use Adobe Premier Pro and make all my own videos. However, that’s just not realistic for 95% of businesses out there to do; or take the time to learn. So, I’m going to really check out makewebvideo.com and see if it will be a good fit for my clients. It looks simple and really professional. I really like the whiteboard ones and have always wanted to make those myself. So who knows, maybe it will be a really good fit for me as well? In the past, people be talking about Camstacia tools which is kind of difficult to use, but thank you for sharing this one with us today…. Videos always plays an important roles, specially when you are in business. You can easily promote your business by using it. So we have to know how can we create a perfect video for our site. Here you explained it step by step. I will definitely use this video maker to make marketing video for my blog. Hey Enstine, thank you for sharing your thoughts! A number of small businesses around the world are discovering the power an online video marketing gives. For a perfectly good reason – it’s easier to implement, most especially through the Hangout Millionaire Internet marketers! Thanks to YouTube, and the like, products and services are now easier to distribute. very lovely post on online video maker ,very briefly explained .The amount is not much also and any body can pay this amount . Finally I can stop trying to create and edit my own videos, or pay too much for something that isn’t worth it! Enstine, please tell me a standard software which can make videos on windows computer. There are indeed a lot of video maker for different purposes out there. It’s just a matter of doing you research and find advantages that you can benefit from. Of course simplicity is the key and always grateful for post like this because it somehow streamline what you are really looking for. Online videos making is really cool idea. Such short Videos provide a dynamic, interactive experience for site visitors. Videos help a lot in increasing ranking in google search results. Also a good explainer video introduce your product in a simple and engaging way. Wow! This video maker seems affordable and looks so simple/easy to use. This would be great for someone new to video marketing. Are you still using MakeWebVideo or did you switch to another software?